A long time ago, my mother brought me some rasam. The scenario described below was acted out, except that I was the one talking about knee pain, and why make rasam. And my mother was the one saying those words. 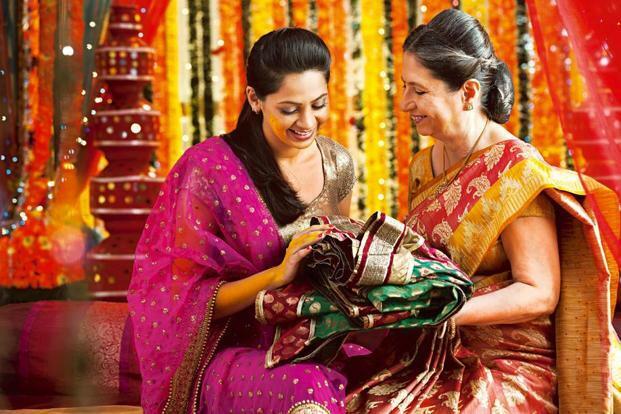 Similarly, years ago, my mother in law was insisting that I buy a sari in Nalli Silks, Chennai. Again, I was refusing like the son-in-law in the scene below. I think gift registrys take the joy out of giving. They sacrifice emotion for efficiency. Indian weddings don’t have gift registrys but here too, we get the same one-horned rhino or jumping cheetah, that you know is a reused gift. You get some pretty horrible recycled gifts at Indian events and then you wonder, maybe registrys will solve this rhino from going from wedding to wedding. Indians give cash too at weddings; as do the Chinese. I guess the thoughtfulness and sentiment works only if there is affection between giver and receiver. Otherwise, you are doomed to getting the one-horned rhino or ticking of “one wine glass in a set of eight” in the gift registry. Imagine this scene. A mother walks into a posh three-bedroom Mumbai apartment, her simple, crumpled cotton sari at odds with the contemporary Malabar Hill home—such as the one portrayed in the movie Rock On!! Her son (a Farhan Akhtar type) is busy on his MacBook. Her daughter-in-law (maybe played by Katrina Kaif) is on a conference call with her office in Milan. The couple greet the old lady politely but distractedly. The mother hands her son some of her home-made chhole (chickpeas). She has heard that he has had a rough week and believes that this childhood dish will comfort him. The daughter-in-law is on an alfalfa diet and will not touch the stuff. “Thanks, mom,” the son says without looking up. He sets the container on the table beside him and continues typing on the keyboard. The mother shuffles around the house for a bit and returns to her son’s study with a spoon. She opens the plastic container and spoons out some chhole into her son’s mouth. “Eat, no,” she says. “Ma,” the son protests and munches on the dish. He is irritated but clearly used to his mother’s force-feeding. Slow shehnai music. A shamed son looks with tear-filled eyes at his mother, realizing for the first time how much flavour a mother’s love can add to the humble chhole. No, this isn’t an audition for a Gauri Shinde screenplay; and not all mothers can cook great chhole. Sometimes a professional chef can give the woman a run for her onion-garlic paste—mother’s love notwithstanding. But the point is about recognizing intangible emotions in tangible gifts. What gifts have you given and received this holiday season? Oscar Wilde said that a cynic is a person who knows the price of everything and the value of nothing. The same could apply to gifts in our busy times. When people get married, they set up a wedding registry, listing out all the household goods they need, want or crave. Gift cards take the guesswork out of giving. They allow us the luxury of not having to mull over what our friend might like. If all else fails, a substantial wad of cash stuffed into a red envelope will not just suffice but be appreciated as well. How then to give a thoughtful gift; and will the thought be recognized, let alone appreciated? When your aunt brings you a duck-shaped cup that you will most likely discard, how to put a value on the fact that she has walked up and down MG Road in the hot sun to search for it? Her taste may be dubious but her intent was pure. To paraphrase Aristotle’s famous quote about anger, giving a gift is easy. But to give the right gift to the right person at the right time and in the right way, that is not easy to do. The same applies to getting a gift. To receive a duck-shaped cup that cost Rs.100 in the right spirit and recognize the sentiment with which it is given is hard to do in these distracted times. You are going through a rough patch. A friend spontaneously gives you her Loro Piana shawl. Use it to keep your spirits up, she says. You don’t need a shawl but you could use the hug it gives you. Your father-in-law takes you suit shopping. You don’t need a suit; you don’t like his taste; and you’ve graduated to custom Mirpuri suits that you source from London. “Buy something,” the old man says in the Raymond showroom that he’s been going to for years. The old man deflates. He’s been lording over the salespeople, showing off his knowledge and clout in the showroom, and your comment strikes like the searing bhut jolokia chilli. You feel bad upon seeing his face, but truthfully, you don’t really need a suit. That’s how you rationalize it anyway. Guilt does the trick where taste doesn’t. You are shamed into picking out an ill-fitting suit in a fabric that you detest in a cut that you will never wear. The question is whether you will value that suit as a gift—not for what it is but for what it signifies. In the thrum of real life when episodes such as this play out, do you recognize sentiment? There comes a point in everyone’s life when parents become superfluous, except in unnameable, unknowable ways. When you hit 30 or 40, you can pretty much take care of yourself. You have systems in place and run a better home than the one you grew up in. You go from being dependent on your parents to providing for them, maharaj-made chhole included. You’ve gotten to a point when you prefer the low-calorie soups that your cook makes at home more than the avial, aloo poshto or dhokla that you grew up with. How then to spot emotion in a gift? How then to swallow it? Had the same mom-feeds-son scenario played out in your home, and this being India, there is no doubt that it routinely does, would you have taken time off from your computer to sit down with your parent for a few minutes and savour the home-made dish that she has brought you? MasterCard came close to putting a value on emotion in its ads. (The) Smythson correspondence cards that your father loves: £40. Burnt Sienna Jewellery’s Raas-Leela set that your mother liked: Rs.16,500. Beam on your parents’ face: priceless. Kabuli chana: Rs.80 a kilo. Home-made spices: Rs.20. Time taken to cook the chhole: 4 hours. Plastic container to pack the chhole: Rs.30. Beam on 40-year-old child’s face: non-existent. Shoba Narayan wishes she could tell you that she recognized the sentiment as much as the gift. I don’t know what is even the point of this article. Of course we can value the sentiment behind the gift. If you are a real Indian then you will of course let your old buy you whatever you like. You’re also forgetting that Indian establishments like Nalli’s and Raymond’s have upgraded their stuff. Even if it is not up to affected Western standards, an Indian should be able to at least get a regular office shirt at any Indian store. Your Dad wants you to buy a suit, you say you want a regular shirt, the compromise preserves his face and your “style”. That bad Kodak moment (you refusing and your dad feeling hurt – with the woeful skirl of shehnai in the background) need not really happen, na? Relation of mother and son is not limited to just one serving of chole. Even if you are distracted at the time (the bad Kodak moment), you’ll of course go back to her and ask her to feed you the chole afterwards and explain that you do appreciate it *and* care for her health. Mothers have been around longer, they understand better than you. Motherly love is not lost to an episode of “chole” even in the worst Indian tele serial. Gift registry is a great idea and I wish it was more popular and/or doable in India. You are also forgetting that many modern couples these days just inform everyone that gifts be either cash or donation (to charity), and everyone including the so-called out-of-fashion uncles and aunts are pretty much good with it. Especially when bride and groom nowadays are overseas and everyone knows they won’t be able to cart back the 5-Liter pressure cooker or the oversized Ganesha statue. So, in the Dad-Son story the Kodak moment is avoided, the Mother-Son story the Kodak moment is adjusted and the wedding story Kodak moment just doesn’t exist. I don’t know why you want to make an Anna Hazare standoff from such improbable Kodak moments anyway. Why not just forget these Kodak moments and have a beer with Dad, a jalebi with mom and a kiss with your sweetheart and let the world just … be? ?